Finding your first job must consider not only what kind of work you would like to do, but also must consider how much money you need in order to survive and thrive. Learn the difference between salary and total compensation, and how you can negotiate with your future boss so that you are compensated at a level so that you can meet your financial obligations. First, you need to know how much it costs you to live. There’s no point in applying for jobs that don’t get you the minimum cash you need! 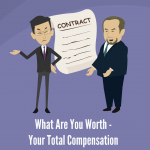 The first video will show you the many components of your total compensation beyond your actual salary and discuss strategies for getting what you need. Use the included worksheet in order to calculate an estimate of those financial needs. The second video is an introduction to understanding of how finance and money works in corporations that will start you on the road to financially literacy. 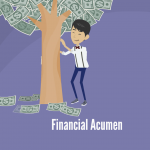 Financial Acumen – Developing a basic understanding of financial language is a must for almost any science role in business. This program recommends basic financial references, walks through the financial results for a small diagnostic company, and is a first step in building your financial acumen.